The latest news hogging the limelight this current examination season is the release of the preliminary answer keys for Engineering, Agriculture and Medical Common Entrance Test (EAMCET), 2019. The aspirants can check the answer key on the official website of the AP EAMCET. 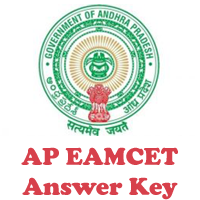 If the candidates of the AP EAMCET, 2019 have any issue with the released answer key, then they can challenge it latest by first week of May, 2019 (Tentative).The candidates can submit their issues in the answer key by post or in person at Convener's Office or through email convenereamcet@gmail.com. As only 2 days are left to challenge the answer key, students must hurry. Engineering, Agriculture, and Medical Common Entrance Test is conducted by Jawaharlal Nehru Technological University Hyderabad (JNTUH) on behalf of Andhra Pradesh State Council of Higher Education across 49 centers of the state. The examination is given separately by engineering and Agriculture and Medical aspirants. AP EAMCET was scheduled to be held on 4th week of April, 2019 (Tentative)..The attendance percentage was good during the examination. Engineering stream witnessed an attendance percentage of 94.37 per cent while medical stream registered a 94.27 per cent attendance.